Here's is one of my very favourite quilts, an oldie but a goldie. Oi Emu! 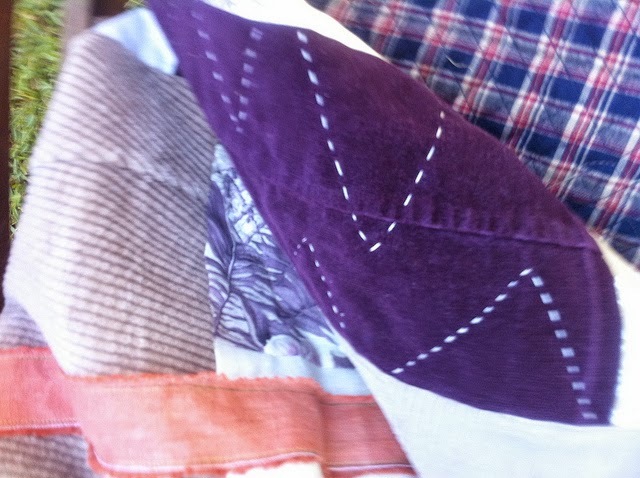 was created when LeeAnn from Nifty Quilts encouraged us to celebrate Corduroy Day, 11/11 in the auspicious year 2011. I got a bag of corduroy pants from the op-shop and pulled out a Emu panel by Sydney screen printers Cloth that I'd gotten not long before. To add some more Aussie talent I threw in some Prints Charming. As for the design I simply played with shapes and had fun with liberated piecing. The quilt just grew from there. When I felt it needed more colour and pattern I added some pieces of old upholstery samples and some coloured linen I'd bought in a scrap bag. 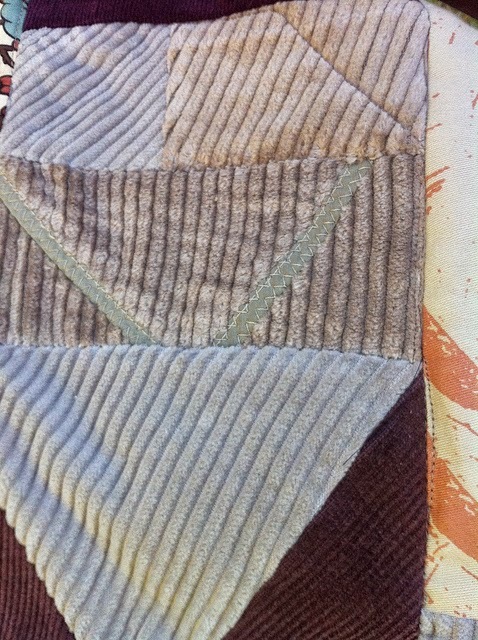 The result is a really earthy quilt that for me has Australian bush look to it. Oi Emu! is my second entry in the Blogger's Quilt Festival. I think it was easier before when we didn't have to classify our quilt into different categories, when we would just show off our quilts. I'm a ditherer at times so I wavered over which category to put this in. At first I thought I'd enter it into the scrap quilt category but in the end I decided to put it into the Art category because of it's modern art leanings. To get into the groove of the theme here are some arty close-up photos.. So what do you think, Is this art? Or just a quilt? Either way it looks great on my lounge room wall where it lives. Thanks to Amy for doing a wonderful job of organising the Blogger's Quilt Festival!! Usually I show new quilts but this time around I've found it a great excuse to share an old favourite, or two - you can see my other entry in the previous post. Let me know in the comments if you have a quilt in the festival so I don't miss popping over to have a look. Deffinately an Art Quilt. Strong color blocks and an Aussie feel with Mr Emu walking by. Definitely art! The Australian colours are beautiful, and the way you've added the thin strips of fabric is inspired. It's also got a bit of wagga quilt in it. It perfectly suits it's home - amazing! Not many quilts work horizontally but it seems many suitable locations in the home demand a horizontal art piece. It's magnificent! I think you have a case for it being art as well as being a quilt. Either way, I love it! It looks beautiful on the wall with your fab orange chairs (they look so comfortably plush!). I love emus. They are one of my favourite Australian animals. Along with echidnas and bush babies! I understand why this is one of your favourites! I love, love, love it and the way you've displayed it is outstanding. The corduroy really adds texture and interest! Good luck in the Festival with this terrific quilt! Hmmm that's strange you ask that question because I think the clamshell quilt is art too! Yes, definitely art:). I hadn't seen this quilt before. Thanks for sharing it! Arty farty.... Whatever... It's AWESOME. Yes Mam, It's art for sure! Good luck in the festival, I'll be voting for you ! It looks perfect on the wall, but I have a sneaky feeling it would look great almost anywhere. hi again.... i love this quilt ~ improv is the best! Wow! That is so perfect over your chairs - very nice tableau together. 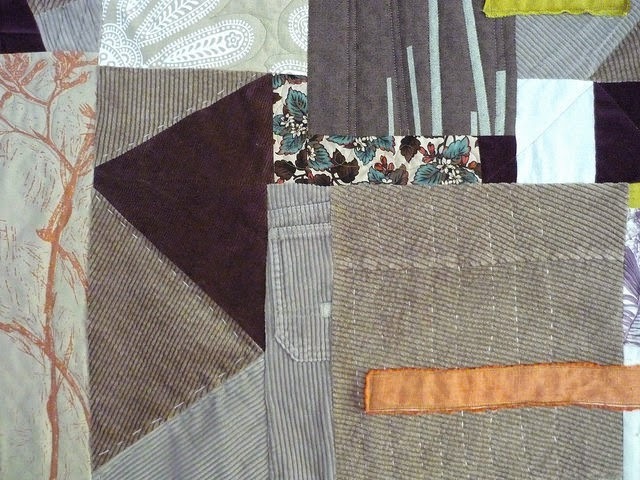 I love this quilt - such fun piecing and the overlay bits add so much. It would be a favorite of mine, too. That's art Rach ! And scrappy too, but definitely gorgeous art! I think it's art!! Love it!! Looks great hanging! I LOVE this quilt! It's an exciting composition. Then I love the little details of pockets and pant seams and little bits of hand stitching. So fun. I will never tire of seeing this quilt! Wow that looks amazing on the wall, what a fabulous quilt. Honestly, you inspire me. 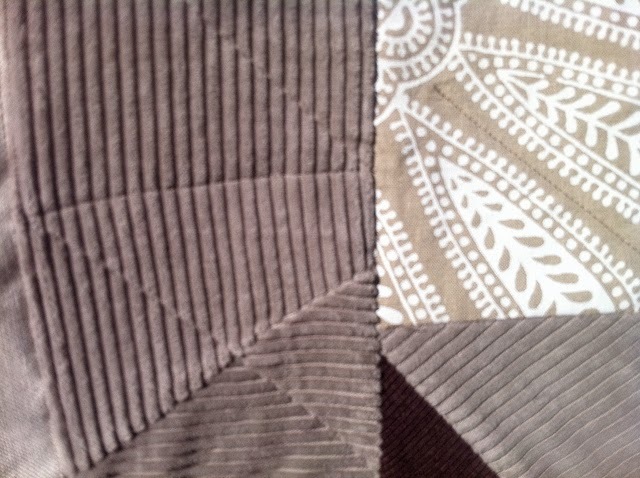 It is such a unique quilt with lots of texture. You are right it looks perfect on the wall! I've always been mad for this quilt -- everything about it, love, love, LOVE! How come the first comment always start with the words I was going to say. But yes, this is definitively art and when <i saw it first I fell in love and haven't fallen out of love since. I actually got a warm and happy feeling when I saw it here again, like meeting an old friend. I could say I was Happy as a Clam. Lol. Which brings me to your last post, what can I say, I just love that quilt too, what is not to love. Oi! What a quilt. It speaks to me of 1970s Canberra and Parliament House, phtographs of dry paddocks from the air, heat and a nation just embracing its difference from UK. How do you make a quilt say so much? You amaze me every time. I do enjoy the way you like to play with your fabrics and really embrace a challenge. It is so good to see it hanging on display in your home and looking like it is in the perfect place! It is a wonderful quilt and you are a quilting superstar. Yes, definitely ART. And I love it, it's gorgeous... great how you combined the different fabric types. Oi! I love this quilt. Definitely art, Rachael. I love that you included the photo of where the quilt lives. It is perfect for that spot. I can see why this one is one of your faves - there is so much to look at. 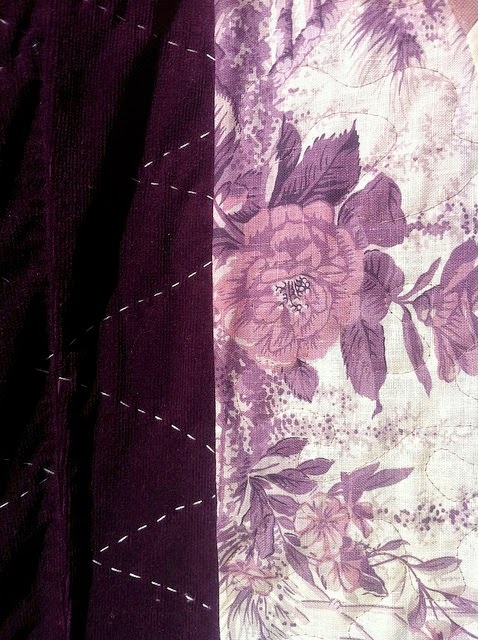 I love all the details you put in the quilt and, of course, the improv aspect of it too. Art! What a fabulous quilt! I love the photo of it on your wall, it makes such a striking feature. You are a very talented girl, creating a piece of art from such an array of pieces of cloth. Yes, definitely an Art Quilt. Oh Art all the way - this is fabulous! I LOVE it on the wall. I think you must have come out of the womb with needle and thread in your hands, hon - you are so talented! So great to see this quilt again. I can understand why it's a favorite. the colors and textures are so great and look fabulous with your Orange chairs!! It's very cool Rachael! I've never quilted with corduroy before -- it looks like it would make for a soft, cozy quilt! 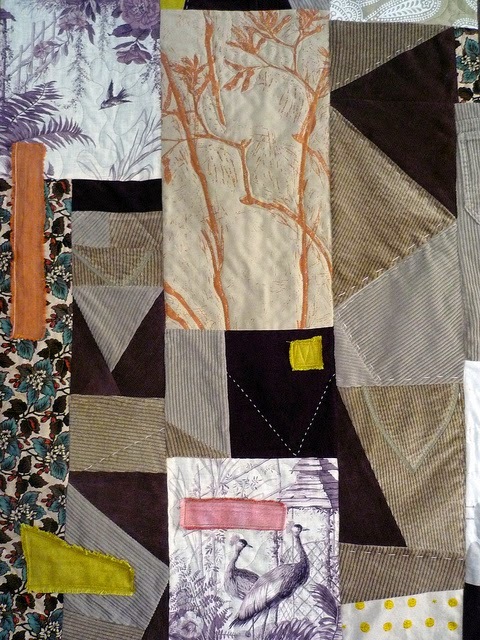 WOW - this is definitely an art quilt, dear Rachael! I havent seen this one before, it's perfect! 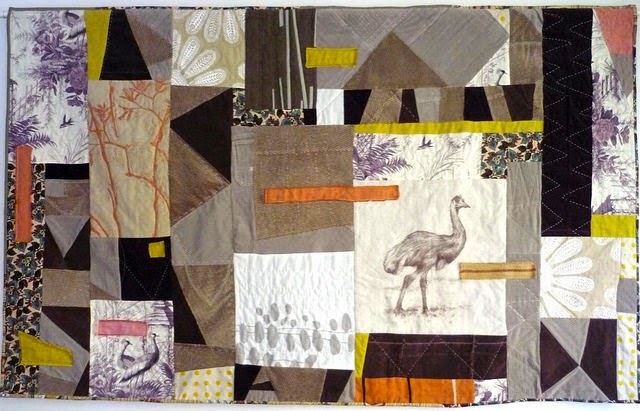 I love all of the shapes and colors and really love the Emu! It's art and It looks beautiful on your wall! I like the touch of purple with the earthy tones and the emu of course. Good luck! 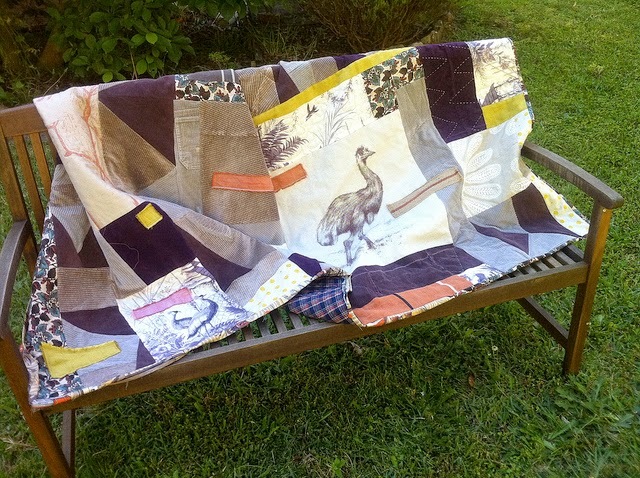 I don't have a quilt,in the festival, but I do have my DH corduroy quilt from boyhood. Very fun. I love your quilt, it is exquisite on your wall. I also enjoyed the close ups. 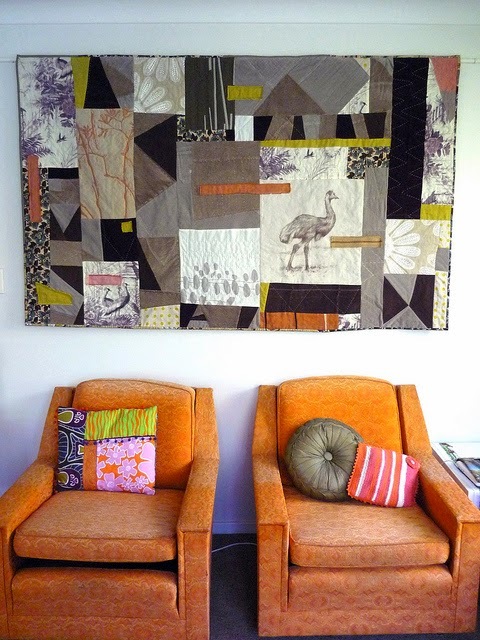 Your quilt looks fabulous as art above the 2 orange chairs Rachael...love it! 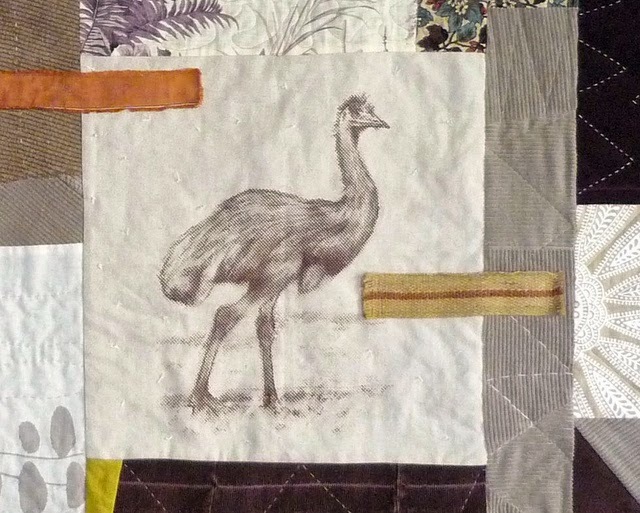 Love your emu quilt. I just got some old fabric samples and upholstery fabric added to my stash to make myself some ART too. Thanks for the inspiration! I love it. You have inspired me to get out my half finished Sue Spargo quilt from her workshop a couple of years ago. I used old upholstery fabric samples in the border, which I think raised a few eyebrows, but when you get down to it there are no rules. Just have fun and I think you had a lot of fun with this quilt. One day I hope to make a quilt with corduroy, denim and tweed.....One day.